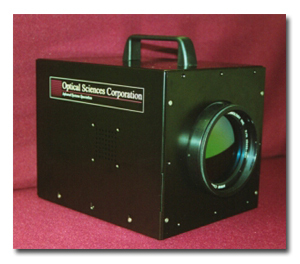 OSC has developed a commercially available DMD-based IR projector consisting of a customized DMD, illumination source, collimating optics, and custom drive electronics. This DMD IRSP is referred to as the Micromirror Array Projector System (MAPS). A photograph of the MAPS is shown in the accompanying picture. The COTS DMD was modified for use in the IR waveband by replacing the standard window with an IR transmissive window. Also, custom drive electronics were designed to provide complete control of gray scales, frame rate, and Pulse Width Modulation (PWM) frequencies. MAPS units are available in formats of 1920x1200, 1920x1080, 1400x1050, 1280x1024, and 1024x768. The MAPS provides a revolutionary, compact, and inexpensive test capability for the evaluation of IR seekers, sensors and FLIRS. Applications of the projector include hardware-in-the-loop testing, portable test sets, built-in testing, production line testing and personnel training. MAPS units may also be configured for testing within the visible and UV wavebands. OSC's DMD-based IRSP & test sets are currently successfully employed across a broad customer group including major defense contractors, universities, government laboratories, private medical community, and international industries. Papers previously published by OSC on the DMD-based infrared scene projector systems are available for download here. Additional technical specifications can be found in the table below. The following images were projected by the MAPS IRSP and collected with a COTS 320x256 MWIR camera. Place mouse over each thumbnail image to view a larger picture. MAPS are controlled via a powerful, yet simple, graphical user interface (GUI). The software provides a clear and intuitive means of controlling the many operational modes of the versatile MAPS. Source control, synchronization, data feed selection, calibration and other operational functions are accessible through the click of the mouse. Status and health of the MAPS are also constantly checked automatically by the control software. 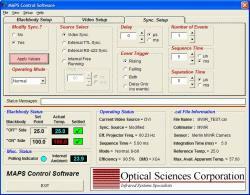 OSC engineers can easily modify the control software for the unique needs of each customer.